New Member of the Family: Rogue RG-624 Left Handed Dreadnought Acoustic Guitar, and related adventures. I’ve ordered a (okay, more than one…admittedly) new toy. Today, I got home from work to find the shiny acoustic guitar I bought from musiciansfriend.com. The price was right, the reviews were good, so I took a chance on it. This is the rc-624 model, and ran me about $75 all said. Money I shouldn’t have spent? Yeah, absolutely, but still the best price on an acoustic that doesn’t sound like dental floss strung across a toad I think I was likely to find. Since when I saw it on ebay, there were only a handful left, I decided to take my chances (though I ordered direct through the site, not via ebay.). And I’m gonna say, I’m very happy with it. Really. I mean, I really don’t think there’s a nicer acoustic out there for this price. 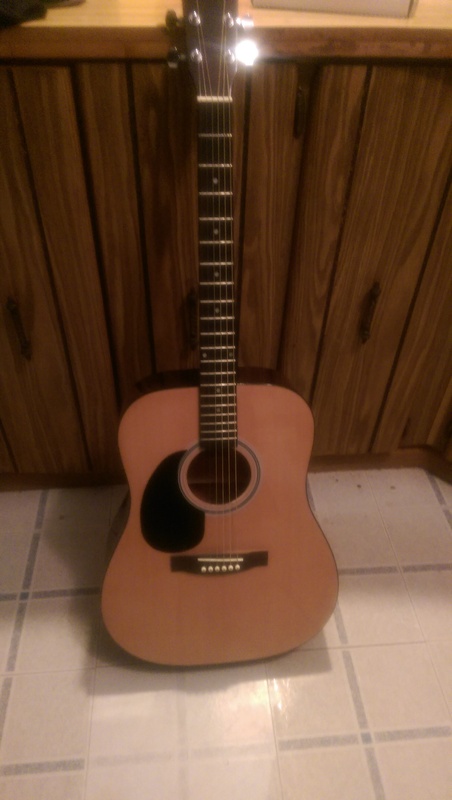 I know it has a spruce top, but have no real info on what the rest of the body is made of. Unlike the acoustic that I’ve been attempting to rebuild (a classical style, so I can totally justify this as being a totally different type of guitar if I can actually get the sucker into playable condition), the action on this is pretty much perfect. The other guitar has action so high I can nearly fit a finger between the frets and strings. I’m really not sure I’ll ever be able to reduce it to a normal height. This though, is set up right on target out of the box. It’s really easy to fret notes – no different at all from my electric. I’d heard acoustics could be harder to play than electrics, so I was really concerned about that, but it seems I had nothing to worry about. It’s got a really warm, clear sound. I imagine once I can actually play something effectively (anything, please! 😦 ) I’m going to have a lot of fun fiddling around with it. I noodled around with it for about an hour, and my only complaint is that now the fingers on my fretting hand are black. lol. I guess there’s some dirt or grease on the strings of fretboard that needs to rub off (or be wiped off. whichever). But from fiddling with it, I’ve realized my next real hang-up. Well, to be fair, I noticed it before, but I didn’t really have words to put to it effectively. In learning to read tab, I’ve realized it doesn’t have nearly enough information in it to tell me what I need to know (as a novice) to make the song on the guitar sound like the song I’m trying to play. There’s no timing, no information on how many times to strum each chord before changing, and I find myself struggling to find the rhythm, especially given my chord changes are still…well, let’s just say they won’t be challenging any hares to races in the near future. I’m sure this is just a matter of developing muscle memory. Of learning the shortest paths between one chord and the next, so I keep telling myself ‘patience’. It would be a lot easier to be patient, though, if I could make something more than ‘Happy Birthday’ and ‘Twinkle Twinkle Little Star’ sound recognizable. lol. I’m still plugging away at ‘Knockin’ on Heaven’s Door’ as my ‘test’ song, because I know the chords and remember the order they go in for the most part, so when I can actually recognize it when I play it, I guess then I’ll know I’m getting somewhere. I think it might be time, also, to start looking up some strumming patterns, and some examples of more effective ways to use my practice time. I’ll be swapping between the acoustic and electric now – primarily focusing on the electric during rocksmith time – which is still priceless to me for the virtue of having some guidance – but the acoustic is much more handy for practicing in front of the tv. I don’t have to plug anything in. I don’t have to wonder if I have any batteries, should the one in my mini-amp die, etc. I’ve also learned, after having tried lots of different picks (the virtue of buying mixed lots. yay), that I’ve definitely got a favorite. Day in and day out I keep reaching for the .60 mm tortex picks (which by sheer coincidence happen to be my favorite color.) I like the thicker .88 tortex pick, too, but In my mix of picks, including some wood ones I thought I would really love, the orange tortex picks are the ones I keep reaching for again and again. I have no idea what that says about me, but there you have it – I’ve picked my picks, for better or worse, and everything else is just extra baggage. Since the electric has the silly rocksmith number stickers on it (for fret counting), the acoustic I think is also going to help me learn to count frets more quickly. I feel like the stickers Rocksmith provides are mutually handy and crippling. You can switch frets quickly because the number is staring right at you, but the trade off is that you don’t get used to looking at the dots, at knowing which frets they’re on, so you don’t have to actually remember anything. Eventually, I’ll take those stickers off, I think, but for now I’m better off to leave things as they are. Next accessory on the agenda, I think is a case for the acoustic – nothing fancy, just something cheap so I can keep it safe from dust and cat hair and hang it out of the way when I’m not using it. A simple cloth case I think will do the job – whatever I can find that’s cheapest to keep my new toy clean and off of the floor so I won’t trip over it in half-conscious delirium before the sun comes up in the morning while I’m fumbling for the lights. All in all though, I’m very happy with the purchase. I guess I’d better buy some spare strings pretty soon, though. What you said about tablature – those are a lot of the reasons that most teachers (and everyone on Talkbass) espouses learning to read music. I don’t think you need to jump on that right away, but its definitely something to consider. It also lets you learn songs slowly because you’ll understand what notes to press and what rhythms and durations to maintain. Also – I think most acoustic guitars have the option of nylon strings instead of steel. This might help to alleviate some of the difficulties with fretting that I’ve also heard about. I don’t have a guitar though, so I can’t say if they’re really harder to play. Yeah, I have dabbled a bit in learning to read music a bit at this point, but my current proficiency is at the ‘See Spot Run’ level. It’s definitely something I plan to come back to bit by bit until it comes more naturally. I get the distinct feeling a guitarist probably is best served to know how to work with both sheet music and tab, but who knows if that opinion will change later. And that about nylon strings is not 100% true. There’s a difference in the bridge. A dreadnought like this one is very specifically a steel string acoustic. I could get nylon strings to string it with, but it’s really not the ideal guitar for that. You also have classical acoustics, which are designed for nylon strings. So there are options to switch back and forth, but at the same time, there are guitars that are better suited to nylon strings, and guitars that are not well suited to them. I have a POS that I’ve been trying to convert to a classical, but it has some serious problems with the body in general, so will probably just end up in the trash in the end. lol. Still an educational process. NextTremolo, Legato, Strumming, and a new toy.